Liczba stron: 22 Jest to ujednolicona liczba stron, która ułatwi Ci porównanie długości książek. Każda strona Legimi to 200 słów. Bertha and Alfred, married for twenty years, enjoy all a truly science fictional life in the twenty-first century. 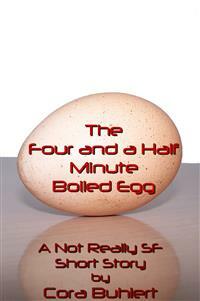 But in spite of all the technological marvels surrounding them, an argument at the breakfast table about egg boiling times escalates and threatens to end their marriage.This parodistic piece is a mundane short story of 3500 words, written in the style of science fiction's "golden age" of the 1940s and 1950s. The challenge was a response to complaints by some more traditionally minded science fiction writers and fans that science fiction had been invaded by literary writing and that the virtues, values and scientific rigour of science fiction’s so-called “golden age” had been forgotten. In response, E.P. Beaumont proposed launching a counter invasion of literary fiction by science fiction. The challenge was to write an entirely mundane and realistic short story in the style of science fiction’s “golden age”, complete with clunky overexplanation of every single piece of technology, no matter how mundane, with which the characters interact. I would also like to apologise to the brilliant German comedian Vicco von Bülow a.k.a. Loriot for borrowing the plot of his famous skid Das Frühstücksei (The Breakfast Egg). However, since the borrowing was done for the purpose of satire, I suspect Loriot would not mind. Perhaps he would even smile. Bertha awoke to the shrill beeping of her alarm clock. She opened her eyes to see the numbers six zero zero edged into the clock face, in truth a display of so-called liquid crystals, that is matter in a state which has properties between those of conventional liquids and solid crystals. What was more, the alarm clock was so accurate that it would neither gain nor lose a single second in an estimated one hundred and thirty eight million years, for it was controlled via a radio signal received from an atomic clock which measured time using the microwave signals that the electrons in a caesium atom emitted while changing energy levels at near absolute zero temperatures.